It may seem hard to believe that a random scribbling or doodle on an empty page or margin of an old book could have much significance. 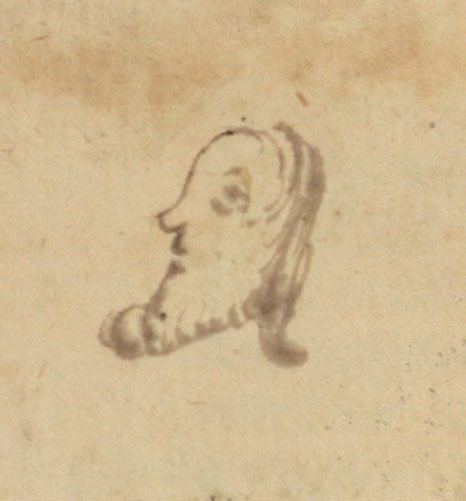 Take for example this face drawn on an otherwise sparse title page of the NLM copy of this Regimen Sanitatis Salernitanum printed in the late 1480s in Leipzig, Germany. Here we have a man with a receding hairline and straggly shoulder-length hair, sporting either a beard or a shirt with a ruffled collar, depending on your point of view. We could speculate endlessly about whose face it is, who drew it, and why. One thing is certain, though. Whoever drew it, could not have imagined that 500 years later, it would be the focus of an inquiry that spanned two continents and involved three prestigious libraries. As the NLM continues to scan its collection of nearly 600 incunabula, we send information about our holdings and links to our publicly available digital surrogates to our European colleagues at the Gesamtkatalog der Wiegendrucke (GW), the union catalog of incunabula compiled by the Staatsbibliothek in Berlin, and, the Incunabula Short Title Catalogue (ISTC), maintained by the British Library. Upon reporting NLM’s link to this Regimen, our colleagues at the GW asked if our copy was the same item listed in the H.P. Kraus Catalogue, no. 209, published in 1999. Our copy had raised the number of known copies in public institutions from three to four copies. 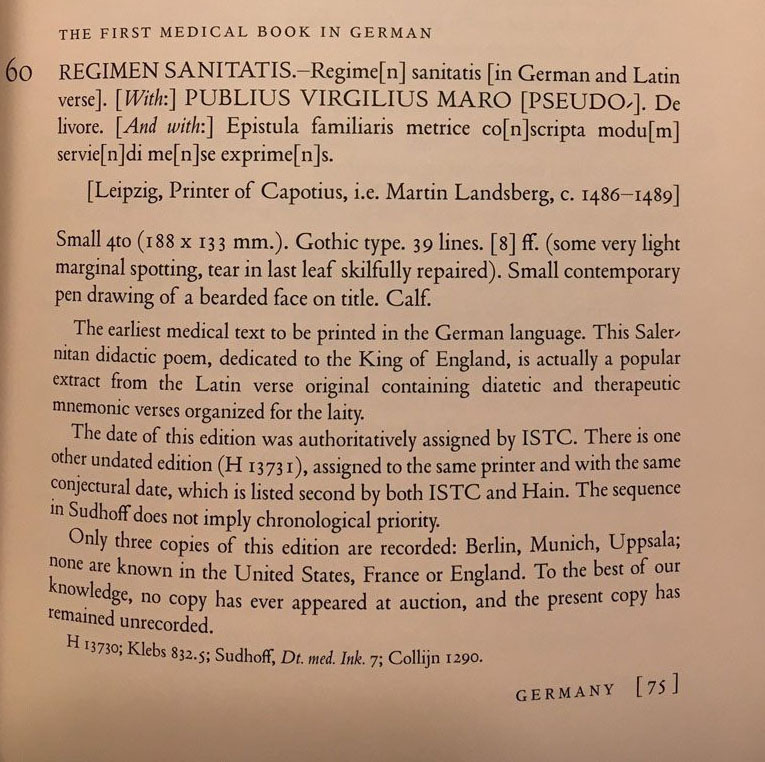 If it were not the item described in the Kraus catalogue, it would mean the discovery of a fifth known copy! It was an intriguing question, to which we did not immediately have an answer. NLM keeps many rare book catalogues, especially those pertaining to medical and scientific books, but Kraus Catalogue no. 209 was not one of them. Our copy was purchased in 2011 from an American book dealer, who had acquired it from a German auction house a few years prior. Neither the bookseller nor the auction house had indicated that the book was described in the Kraus catalogue. Having reached a dead-end, tracing the book’s provenance backwards in time, it was time to find the Kraus catalogue itself. That little drawing, so prominently placed on the title page, is a unique identifying feature that would have been mentioned in any rare book dealer’s catalogue entry. Our bibliophile readers will not be surprised to learn that we turned to our colleagues at the Grolier Club in New York City for assistance. Their collection of bookseller catalogs, both domestic and international, is unsurpassed. And despite being under renovation when we contacted them, the staff were still able to send us the requested catalogue entry in a matter of hours. — H.P. Kraus Catalogue, no. 209, 1999. Mystery solved. Yes, our copy was indeed the Kraus copy. Identification confirmed, thanks to a seemingly inconsequential drawing made hundreds of years ago. Now, if only it were so easy to find out who drew it! Visit LocatorPlus, the Library’s holdings catalog, to view the full catalog record for Regimen Sanitatis Salernitanum. Laura Hartman is Rare Book Cataloger in the History of Medicine Division at the National Library of Medicine. When I shared the post with the medieval medicine listserve, Thomas Gloning, a historian of medieval/Renaissance medicine at the University of Giessen, immediately supplied the meaning of the manuscript annotation in your illustration (p14/24 of the NLM pdf https://collections.nlm.nih.gov/ext/dw/101563011/PDF/101563011.pdf). “Von aderlaßen” (singular), but rather “aderleßen”. a case of a topic marker in margine. The language is Early New High German. With continuing thanks for all the work NLM librarians are doing to digitize these treasures! Many thanks! I have updated our cataloging record accordingly.